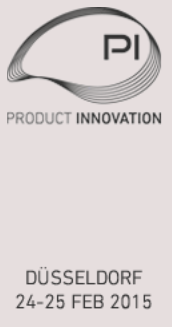 This is the fifth year that marketkey organized their vendor-independent conference in Europe around Product Innovation, where PLM is the major cornerstone. Approximate 100 companies attended this conference coming from various industries. As there were most of the time two till four parallel tracks (program here), it will still take time for me to digest all the content. 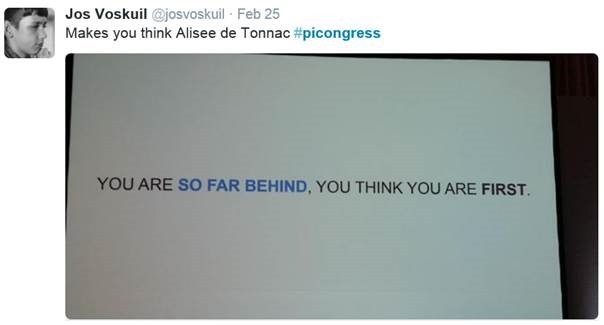 However here a first impression and a comparison to what has changed since the PI Conference in 2014 – you can read my review from that conference here. First of all the keynote speeches for this conference were excellent and were a good foundation for attendees to discuss and open their mind. Secondly I felt that this conference was actually dealing with the imminent shift from classic, centralized businesses towards the data-centric approach to connectivity of information coming from anyone / anything connected. Naturally the Internet of Everything (IoE) and the Internet of Things (IoT) were part of the discussion combined with changing business models: moving from delivering products toward offering services (CAPEX versus OPEX). The first keynote speaker was Carlo Rati Director, MIT Senseable Lab. He illustrated through various experiments and examples how being connected through devices we can change and improve our world: tagging waste, mobile phone activity in a city and the Copenhagen Wheel. His main conclusion (not a surprise): For innovation there is a need to change collaboration. Instead of staying within the company / discipline boundaries solving problems through collaboration between different disciplines will lead to different thinking. How is your company dealing with innovation? The second session I attended was John Housego from W.L. Gore and Associates who explained the company’s model for continuous growth and innovation. The company’s future is not based on management but based on leadership of people working in teams in a flat organization. Every employee is an associate, directly involved and challenged to define the company’s future. Have a read about the company’s background here on Wikipedia. Although the company is 50 years old, I realized that their cultural model is a perfect match with the future of many businesses. More and more companies need to be lean and flexible and support direct contact between the field, customers, market and experts inside the company. Implementing a modern PLM platform should be “a piece of cake” if the technology exists, as W.L. Gore’s associates will not block the change if they understand the value. No silos to break down. My presentation “The Challenge of PLM Upgrades as We See the Rules of Business Change” was based around two themes (perpetual software ? / seamless upgrades ?) and from there look towards the future what to expect in business. When we look back, we see that every 10 years there is a major technology change, which makes the past incompatible to upgrade. Now we are dreaming that cloud-based solutions are the future to guarantee seamless upgrades (let’s wait 10 years). To my opinion companies should not consider a PLM upgrade at this moment. The changes in business models, people behavior and skills plus technology change, will enable companies to move towards a data-centric approach. Companies need to break with the past (a linear, mechanical-design-based, product development approach) and redesign a platform for the future (a business-innovation platform based on the data). In my upcoming blog post(s) I will give more background on this statement. Trond Zimmerman from the Volvo Group Truck explained the challenges and solution concept they experienced as they are currently implementing answering the challenge of working in a joint venture with Dongfeng Commercial Vehicles. As in a joined venture you want to optimize sharing of common parts, still you cannot expect a single PLM solution for the total joint venture. For that reason, Volvo Group Truck is implementing Share-A-Space from Eurostep to have a controlled collaboration layer between the two joint venture partners. This is, to my opinion, one of the examples of future PLM practices, where data will not be stored in a single monolithic system, but data will be connected through information layers and services. The case is similar to what has been presented last year at Product Innovation 2014 where Eurostep and Siemens Industrial Turbomachinery implemented a similar layer on top of their PDM environment to enable controlled sharing with their suppliers. David Rowan from wired.co.uk closed the day with his keynote: Understanding the New Rules of Product Innovation. He touched the same topic as John Housego from W.L. Gore somehow: it is all about democratization. Instead of hierarchy we are moving to network-based activities. And this approach has a huge impact on businesses. David’s message: Prepare for constant change. Where in the past we lived in a “linear” century, change according to Moore’s law, we are entering now an exponential century where change is going faster and faster. Besides examples of the Internet of Thing, David also gave some examples of the Internet of Stupid Things. He showed a quote from Steve Balmer stating that nobody would pay $ 500 for a phone (Apple). The risk he made is that by claiming some of these stupid inventions might lead to a quote in the future. I think the challenge is always to stay open-minded without judging as at the end the market will decide. I spent the evening networking with a lot of people, most of them excited about the future capabilities that have been presented. In parallel, the discussion was also about the conservative behavior of many companies. Topics that are already for ten years under discussion – how to deal and connect PLM and ERP, where is the MBOM, what are the roles of PLM and ERP for an organization, are still thankful topics for a discussion, showing where most companies now are with their business understanding. In parallel to a product innovation conference apparently there is still a need to agree on basic PLM concepts from the previous century. The second day opened with an excellent keynote speech from Dirk Schlesinger from Cisco. He talked about the Internet of Everything and provided examples of the main components of IoE: Connectivity, Sensors, Platform, Analytics, and Mobility. In particular the example of Connectivity was demonstrating the future benefits modern PLM platforms can bring. Dirk talked about a project with Dundee Mining where everything in the mine was tagged with RFI devices (people, equipment, vehicles, and resources) and the whole mine was equipped with Wi-Fi. Based on this approach the execution and planning of what happened was done in their HQ through a virtual environment, giving planners immediate visibility of what happens and allowing them to decide on real data. This is exactly the message I have posted in my recent blog posts. The most fascinating part were the reported results. This project is ongoing now for 3 years and the first year they achieved a production increase of 30 %. Now they are aiming for this year for a 400 % production increase and a 250 % efficiency increase. These are the numbers to imagine when you implement a digital strategy. It is no longer any more about making our classical processes more efficient, it is about everyone connected and everyone collaborates. Marc Halpern from Gartner gave an good presentation connecting the hype of the Internet of Things with the world of PLM again, talking about Product Innovation Platforms. Marc also touched on the (needed) upcoming change in engineering processes. More and more we will develop complex products, which need system thinking. Systems of Systems to handle this complexity, As Marc stated: “Product, process, culture is based on electro-mechanical products where the future trend is all about software.” We should reconsider our Bill of Materials (mechanical) and think probably more about a Bill of Features (software). Much of Marc’s presentation contained the same elements as I discussed in my PDT2014 blog post from October last year. I was happy to see Jenni Ala-Mantila presenting the usage of PLM system for Skanska Oy. Skanska is one of the largest construction companies operating global. See one of their beautiful corporate videos here. I always have been an advocate to use PLM practices and PLM infrastructure to enhance, in particular, the data-continuity in a business where people work in silos with separate tools. There are so many benefits to gain by having an end-to-end visibility of the project and its related data. Jenni’s presentation was confirming this. By implementing a PLM backbone with a focus on project management, supplier collaboration and risk management, she confirmed that PLM has contributed significant to their Five Zero – vision: Zero loss-making projects, Zero Environmental incidents, Zero Accidents, Zero Ethical breaches and Zero Defects. Skanska is really a visionary company although it was frustrating to learn that there was still a need to build a SharePoint connection with their PLM environment. The future of data-centric has not reached everyone in the organization yet. Jos, as always a good summary. I participated in a couple of sessions where the extended enterprise and supplier integration was discussed and I see much more awareness now than some years ago. Change is needed there as well to move from the concept of letting suppliers into the internal PLM and ERP systems. But end users have a tough time to digest everything possible and still run their daily business. Sometimes it looks so easy for the startups with no legacy. Great summary, really well focused to critical subjects of the event. I agree with you, PLM world seems to break its shell. « Platform, Backbone, Service Bus or BI for PLM?